Zong 4G has introduced a 27% discount on its postpaid packages. 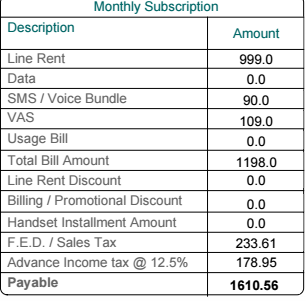 Under its latest offers, customers will be able to avail special discounts on Z500, Z900 and Z1500 postpaid packages. Zong 4G, is the leading 4G operator of Pakistan with a 75% 4G market share and 4G coverage in over 300 cities nationwide. Ye Kiya Bat Howi ??? I am surprised how much time you have to comment on every single Post. is he paid from Propakistani to entertain readers? How much will be 365 including taxes? multiply 365 by 1.3624 you will get the Answer. 365 + 116.8 = 481.8 will be the exact bill. the discount is for 6 months only. “For How long subscriber can avail this Offer? BizXcess packages were way better and cheaper for economical users. please revised it. They are not gonna revise it. It is left for corporate companies only. Individuals will have to choose from new packages. 2-3 month old new ab yaad aye post krni? Payment Ruki Howi thi Zong Walo Se Sponsored Ki: Ab A Gayi hai to Release articles. Buhat he economical packages hein ? Bus hamary area mein aik KHAMBAA laga dein ? When you have nothing to post so you post 2 month old news. Ps. These discounts are only for 6 cycles.